I love this time of year. Summer is winding down (this part I don't love so much), and students are getting ready to return to school. My work as a college counselor allows me to meet first-time college students. Many are unsure or nervous about coming to college...no longer the big fish in a small pond...but still excited about the challenges awaiting them. Their excitement moves me, and I am privileged to view the world through their eyes. While I am in the twilight of my work life, their journey is just beginning. Opportunities are scattered everywhere, waiting for the students to find them, pick them up and run with them. So many choices to make; I'm sure it can be overwhelming. But even when we are beyond this, our lives more settled, orderly, predictable...we still have the choice to stop for a moment and look at life with new eyes. If each day seems the same as the last, we can choose to make each day different. Aldous Huxley said "The secret of genius is to carry the child into old age, which means never losing your enthusiasm." Reach inside yourself to find that child who once saw the world filled with opportunities, who had endless imagination. 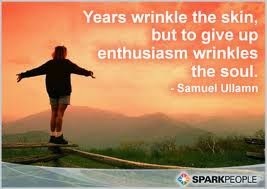 Unleash new enthusiasm for life...erase the wrinkles from your soul. You can do this.